So THAT'S how to give your hair a Mary Berry boost! 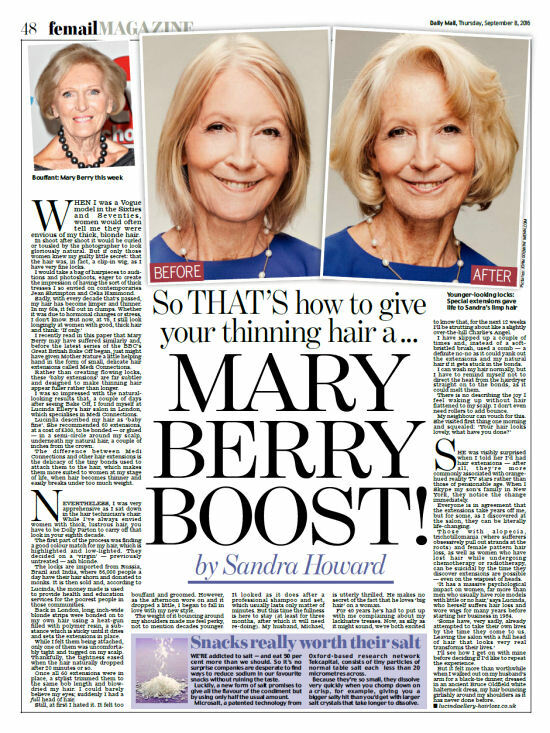 Former Vogue model Sandra Howard, now in her seventies, has always had fine hair. Here she writes for the Daily Mail about how our Medi Connections have given her the bounce and volume she's always longed for. When I was a Vogue model in the Sixties and Seventies, women would often tell me they were envious of my thick, blonde hair. In shoot after shoot it would be curled or tousled by the photographer to look gloriously natural. But if only those women knew my guilty little secret: that the hair was, in fact, a clip-in wig, as I have very fine locks. I would take a bag of hairpieces to auditions and photoshoots, eager to create the impression of having the sort of thick tresses I so envied on contemporaries Jean Shrimpton and Celia Hammond. I recently read in this paper that Mary Berry may have suffered similarly and, before the latest series of the BBC's Great British Bake Off began, just might have given Mother Nature a little helping hand in the form of small, delicate hair extensions called Medi Connections. Rather than creating flowing locks, these 'baby extensions' are far subtler and designed to make thinning hair appear fuller rather than longer. I was so impressed with the natural looking results that, a couple of days after seeing Bake Off, I found myself at Lucinda Ellery's hair salon in London, which specialises in Medi Connections. Lucinda described my hair as 'baby fine'. She recommended 60 extensions, at a cost of £300, to be bonded — or glued — in a semi-circle around my scalp, underneath my natural hair, a couple of inches from the crown. The difference between Medi Connections and other hair extensions is the delicacy of the tiny bonds used to attach them to the hair, which makes them more suited to women at my stage of life, when hair becomes thinner and easily breaks under too much weight. Nevertheless, I was very apprehensive as I sat down in the hair technician's chair. While I've always envied women with thick, lustrous hair, you have to be Dolly Parton to carry off that look in your eighth decade. The first part of the process was finding a good colour match for my hair, which is highlighted and low-lighted. They decided on a 'virgin' — previously untreated — ash blonde. The locks are imported from Russia, Brazil and India, where 86,000 people a day have their hair shorn and donated to monks. It is then sold and, according to Lucinda, the money made is used to provide health and education services for the poorest people in those communities. Back in London, long, inch-wide blonde strips were bonded on to my own hair using a heat-gun filled with polymer resin, a substance which is sticky until it dries and sets the extensions in place. While I felt them being attached, only one of them was uncomfortably tight and tugged on my scalp. Thankfully, the tightness eased when the hair naturally dropped after 20 minutes or so. Once all 60 extensions were in place, a stylist trimmed them to the same bob length and blowdried my hair. I could barely believe my eyes; suddenly I had a full head of hair. Still, at first I hated it. It felt too bouffant and groomed. However, as the afternoon wore on and it dropped a little, I began to fall in love with my new style. The weight of it bouncing around my shoulders made me feel perky, not to mention decades younger. It looked as it does after a professional shampoo and set, which usually lasts only matter of minutes. But this time the fullness is here to stay (at least for three months, after which it will need re-doing). My husband, Michael, is utterly thrilled. He makes no secret of the fact that he loves 'big hair' on a woman. For 40 years he's had to put up with me complaining about my lacklustre tresses. Now, as silly as it might sound, we're both excited to know that, for the next 12 weeks I'll be strutting about like a slightly over-the-hill Charlie's Angel. I have slipped up a couple of times and, instead of a soft-bristled brush, used a comb - a definite no-no as it could yank out the extensions and my natural hair if it gets stuck in the bonds. I can wash my hair normally, but I have to remind myself not to direct the heat from the hairdryer straight on to the bonds, as it could melt them. There is no describing the joy I feel waking up without hair flattened to my scalp. I don’t even need rollers to add bounce. She was visibly surprised when I told her I’d had hair extensions — after all, they're more commonly associated with orange-hued reality TV stars rather than those of pensionable age. When I Skype my son's family in New York, they notice the change immediately. Everyone is in agreement that the extensions take years off me, but for some, as I discovered at the salon, they can be literally life-changing. Those with alopecia, trichotillomania (where sufferers obsessively pull out strands at the roots) and female pattern hair loss, as well as women who have lost hair while undergoing chemotherapy or radiotherapy, can be suicidal by the time they discover extensions are possible - even on the wispiest of heads. 'It has a massive psychological impact on women, far more than men who usually have role models with little or no hair,' says Lucinda, who herself suffers hair loss and wore wigs for many years before starting her business in 1984. I'll see how I get on with mine before deciding if I'd like to repeat the experience. But it felt more than worthwhile when I walked out on my husband's arm for a black-tie dinner, dressed in an ancient Bruce Oldfield white halterneck dress, my hair bouncing girlishly around my shoulders as it has never done before.